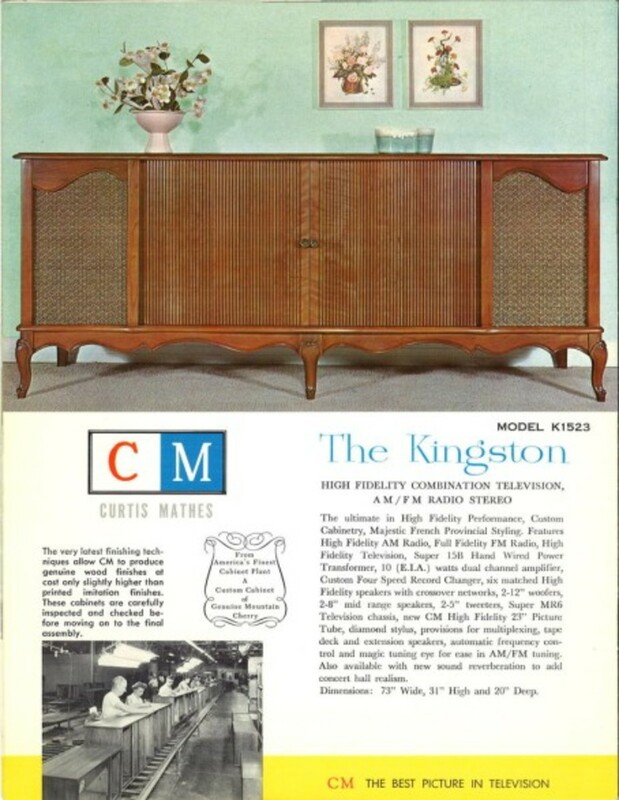 The Curtis Mathes Kingston Model K1523 has the best high fidelity or what we now call hi-fi sound reproduction. This console set the high mark for home stereo listeners back in 1960 and even today home audio enthusiasts will have a hard time beating the sound quality of this beautiful machine of music. Many audiophiles still refer to high-quality sound quality of these early CM stereos as the zenith of design in the manufacture of music centers. In the 1950s, many audio manufacturers like Curtis Mathes used the phrase high fidelity as a marketing term. But with the CM Company it truly did describe remarkable speakers and equipment intended to provide faithful sound reproduction that was made of the finest material and quality. The making of a masterpiece at Curtis Mathes starts with great planing and craftsmanship. All components in this 1960 console were made by the four major plants owned by the Curtis Mathes Company at that time. The plant in Austin made the picture tube, turntable, radio and vacuum tubes. The plant in Athens and Dallas made the cabinets and speakers, Raw chassis materials are punched out and finished at the plant in Houston along with every nut and bolt, the back board for the console, and the speaker fabric. This is an all Texas made beauty. Every part receives careful inspection and testing before being assembled into the completed chassis. 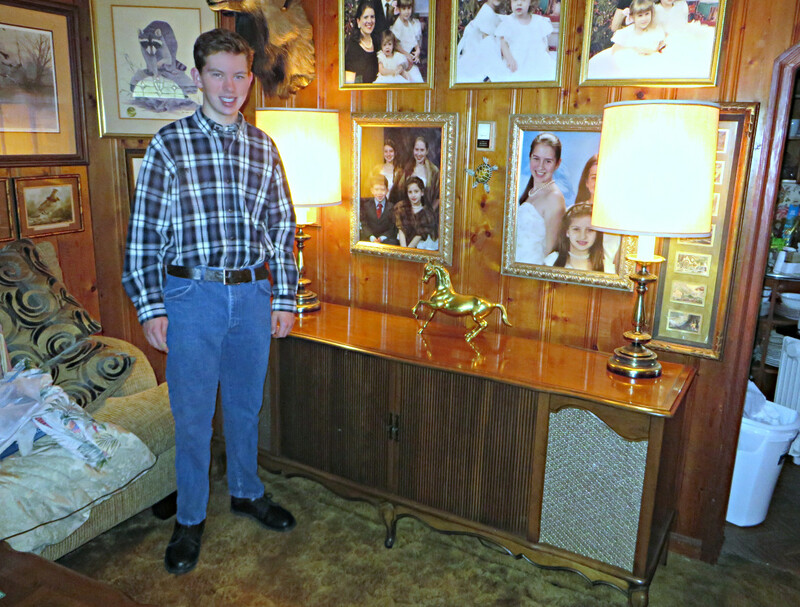 George Curtis Mathes had a dream of having the best line of radios and televisions ever made in the world. 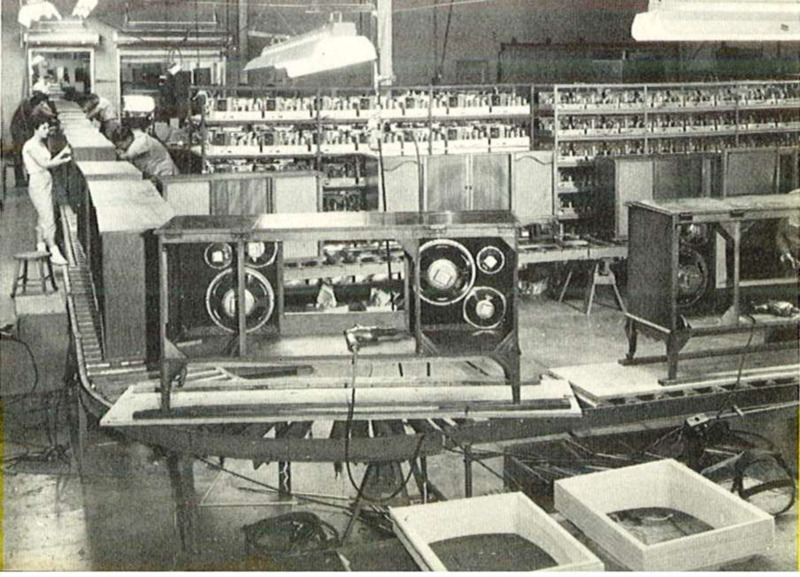 When stereos came out in the late 1950s he was the first to put together a group of experts in the high fidelity field at his plants in Dallas and Austin Texas. George who preferred to be called Curtis, started early in his live loving electronics when he became a distributor and manufacturer. He was a cooler and fan pioneer with his Mathes Cooler Fans to cool down Texas and Midwestern homes with the first air conditioning ever seen in that area. Geroge Curtis studied architecture at the University of Texas. Curtis established an early distributorship for the remarkable Philco Radio Company in the small town of Amarillo, Texas during the depression years. The Mathes Company moved to the booming Fort Worth area just before the start of World War II. It was after the the war that the Mathes Coolers Company started growing by leaps and bounds, being the mid-west largest manufacturer of cooler fans, and evaporator coolers, and by the early 1950s they had a line of Mathes room air conditioners, the first air conditioners made and sold in Texas. George Curtis soon started manufacturing furniture and very high end and great quality solid wood cabinetry for his own Mathes Cooler fan products. 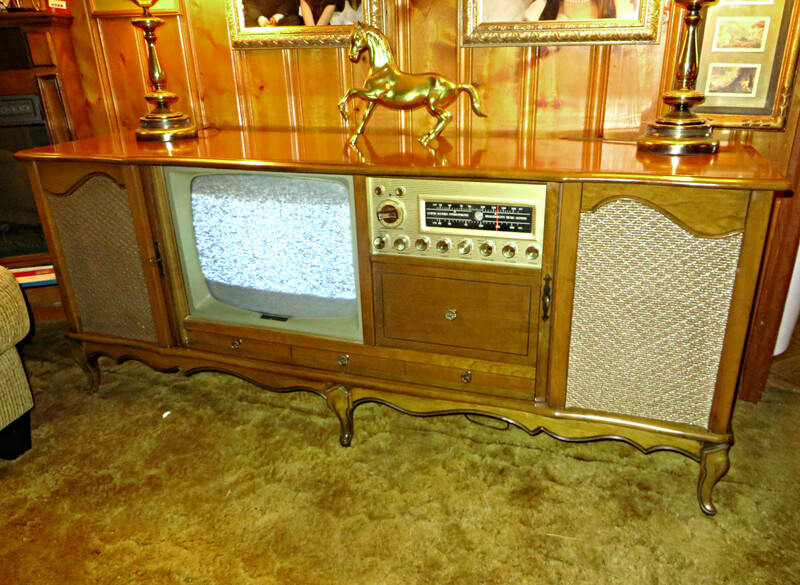 In 1957 George created the world renowned Curtis Mathes Corporation, this was the only family owned furniture, cooler fan, and electronics company of its kind, the first it the region to manufacturing well designed high fidelity music entertainment systems, and they even manufactured their own black and white and later color televisions. Soon there were Curtis Mathes Dealerships throughout the entire United States. With this type of masterpiece, the high fidelity radio chassis required careful attention to details and rigid inspections characterize assembly of the CM products. Pretested components are carefully assembled in light, air conditioned assembly areas. 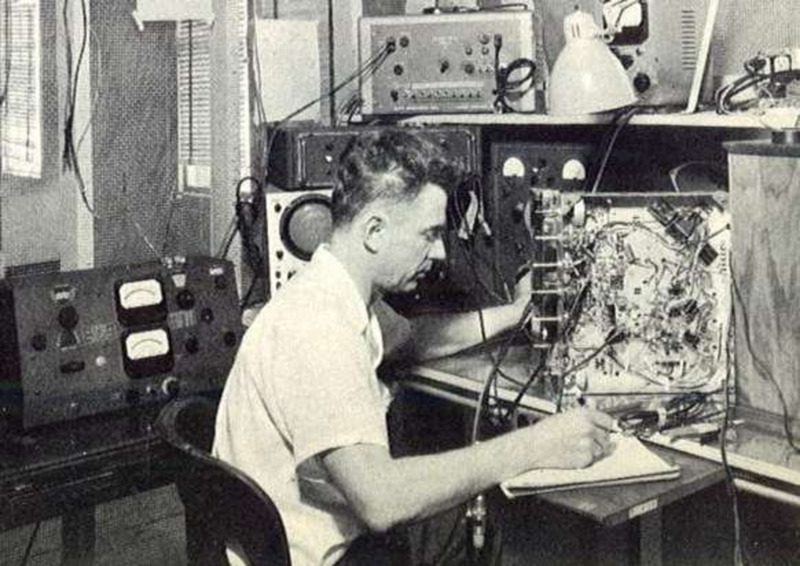 Hand soldering and precision placement of tubes and wires insure endless years of pleasure from all Curtis Mathes radios. 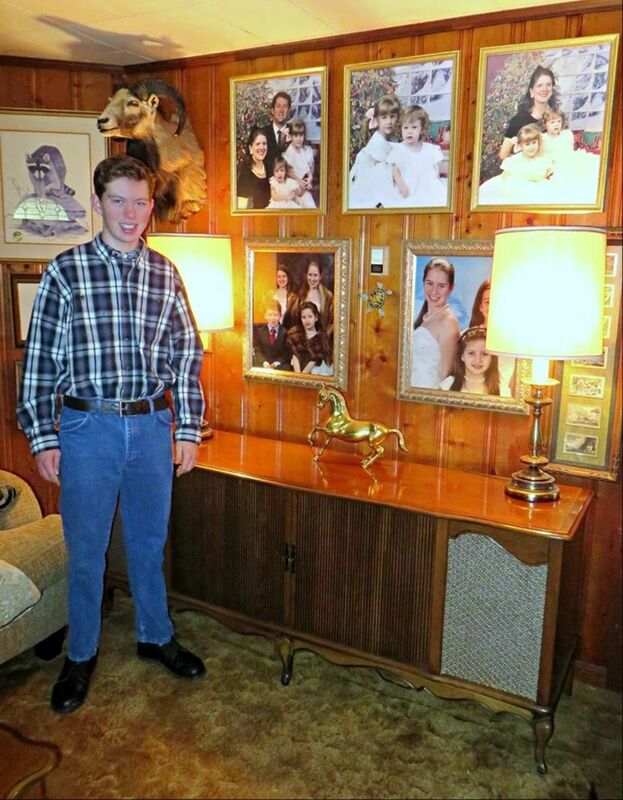 The Curtis Mathes firm had modern well designed factories in Austin, Dallas, Houston, and Athens Texas. 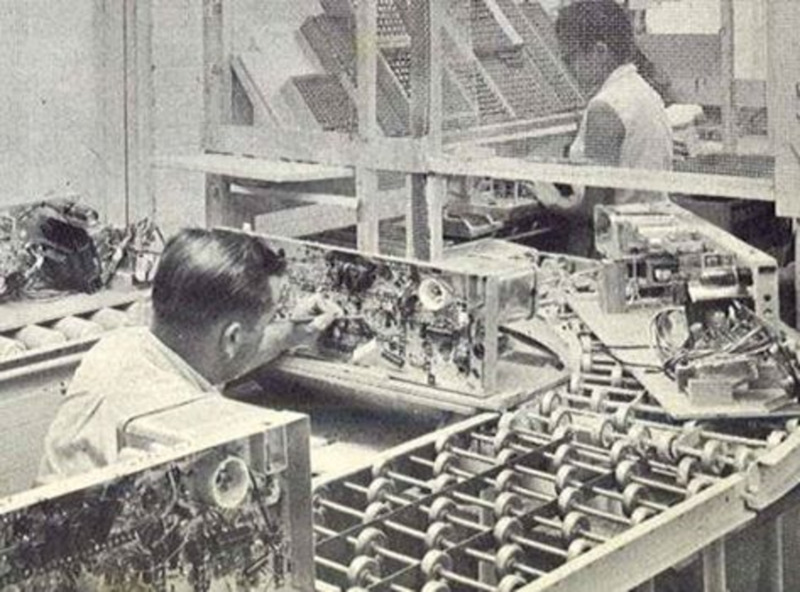 Satellite plants that produced components for the Texas factories were in Benton, Arkansas, and later in the 1960s plants were also built for stereo components in Nuevo Laredo, Tamaulipas, and in Toa Alta, Puerto Rico, and a black and white portable television plant was built in St.Kitts. The Curtis Mathes Company produced many beautiful models considered endearing by most modern and retro audiophiles. This was the time when the Kingston Model K1523, High Fidelity Combination was made. Curtis Mathes In the late 1950s and early 1960s, led to the next wave of home-audio improvement, and in common parlance with the new ear, stereo displaced hi-fi. The mass-produced records were now being played on a stereo. In the world of the true audiophile, however at the sound laboratories of Curtis Mathes, high fidelity gurus continued and lab assistance continued to refer to the goal of highly accurate Mathes sound reproduction and to the Cm Company endless technological resources were made available for approaching that goal. 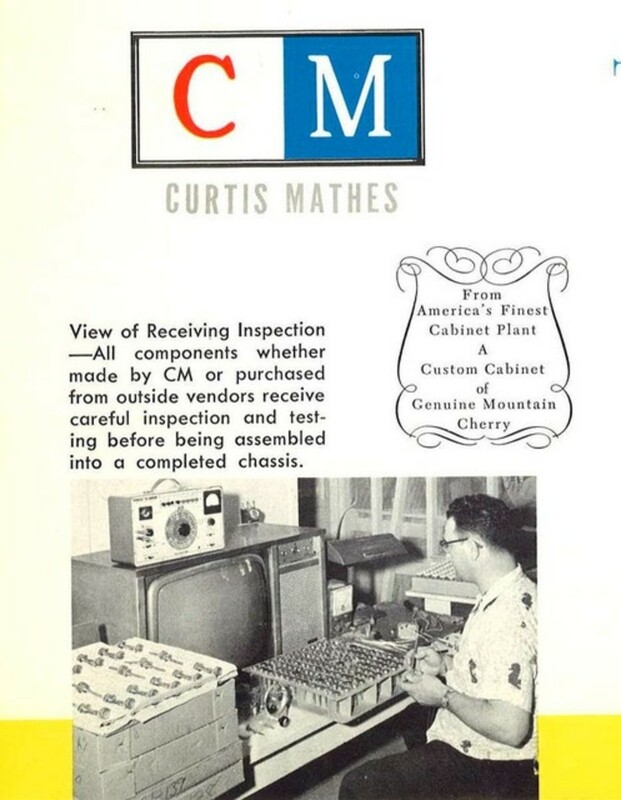 This period in the history of the Curtis Mathes Company was most widely regarded as "The Golden Age of Mathes Hi-Fi’s", when the Curtis Mathes plants still made their own tube equipment and did not have to rely on other manufacturers of that time. The Curtis Mathes Company produced many beautiful models considered endearing by most modern and retro audiophiles. This was the time when the Kingston Model K1523, High Fidelity Combination was made. By fabricating and plating its own chassis Curtis Mathes not only controls quality but also outside cost. 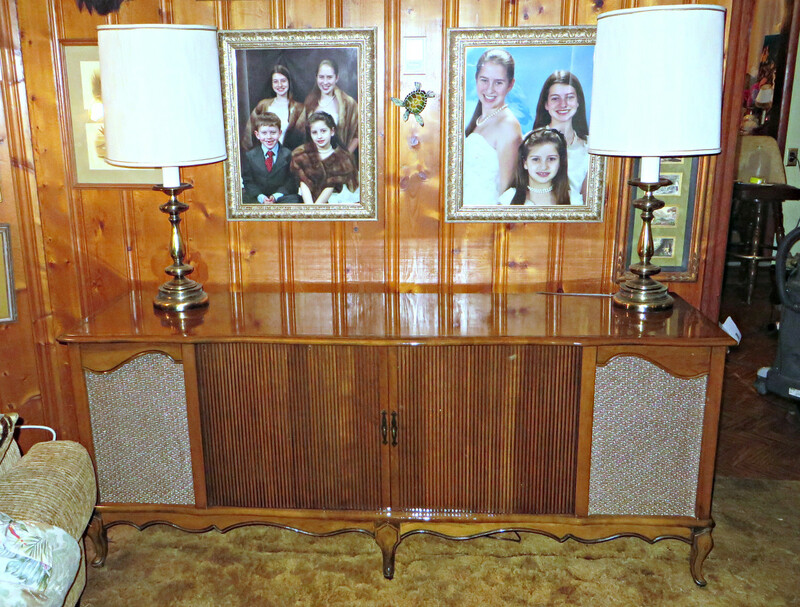 The Kinston has a high fidelity AM radio, full fidelity FM radio, high fidelity television. Super 15H hand wired power transformer. 10(EIA) watts dual changed amplifier, custom four speed record changer, six matched high fidelity speakers with crossover network. Two -12 inch woofers, Two 8 inch mid rage speakers, Two 5 inch tweeters. The super MR television chassis has the new CM high-fidelity 23 inch picture tube. There is a diamond styles on the Curtis Mathes turntable, and provisions for multiplexing and a tape deck, and external speakers. The Kingston Model K1523, High Fidelity Combination was way ahead of it time, and a very popular type of system for reproducing great music beginning in the 1960s. This system was the first integrated music system in the world that combined a state of the art phonograph, an all tube stereo radio AM_FM tuner, a custom built Mathes turntable and an amazing all tube preamp, and the best made and very powerful tube amplifier in one beautiful French console package. The finest of all home entertainment centers has to have the best speakers. These Curtis Mathes speakers are handmade to insure the best performance. The Kingston Model K1523, high fidelity combination sound provided a partial solution to the problem of creating some semblance of the illusion of live orchestral coming out of the remarkable wood in cased speaker system help do away with the phantom middle section when the listener sits exactly in the middle of the two front loudspeakers. Because there were over six speakers and hollow echo champers built into the Curtis Mathes stereo you could sit anywhere in the room and get great sound. When the listener moves slightly to the side there was no phantom channel disappearing or was there greatly reduced sound quality. . An attempt to provide sound like the Kingston Model K1523 was tried in the 1970s through many other stereos with quadraphonic sound but, again this could not match the Curtis Mathes, Kingston Model K1523. The length 73 inches, width 31 inches and height 20 inches. The Kingston Model K1523 was a Texas size beauty. 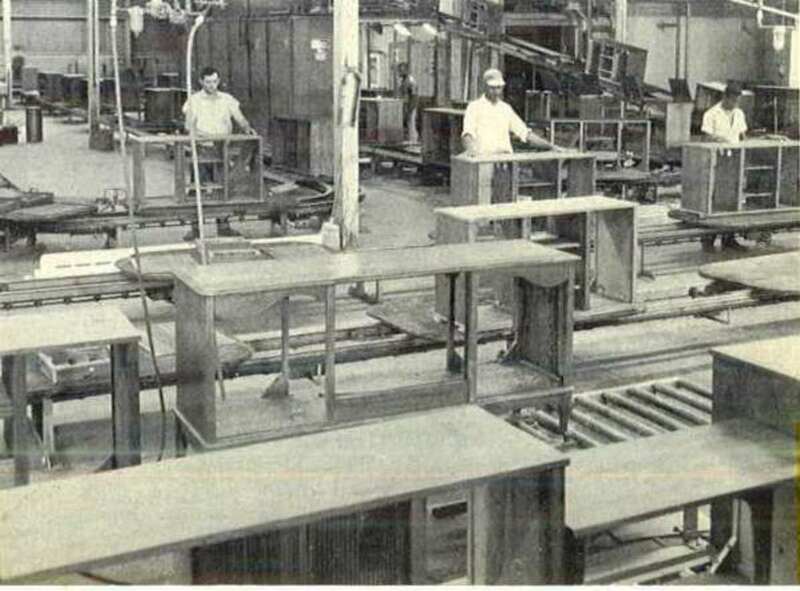 The photo below shows the Cabinet Assembly of the Curtis Mathes Plants in Texas requires careful quality control in the manufacture of wood parts, this work pay dividends in the assembly of cabinets in the cabinet room. 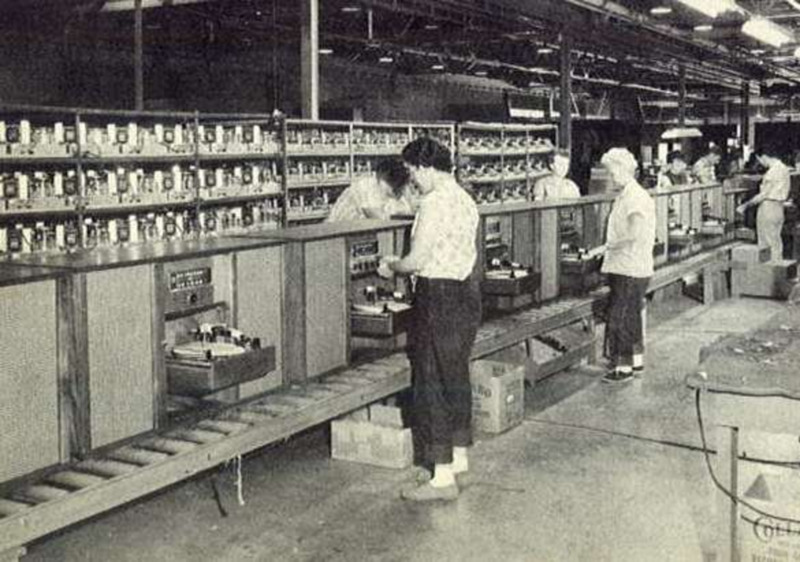 Shown here are workers assembling, fitting and inspecting high fidelity cabinets. The very latest finishing techniques of the time allowed Curtis Mathes to produce genuine wood finishes at cost only slightly higher than their cheaper made partial board competitors. 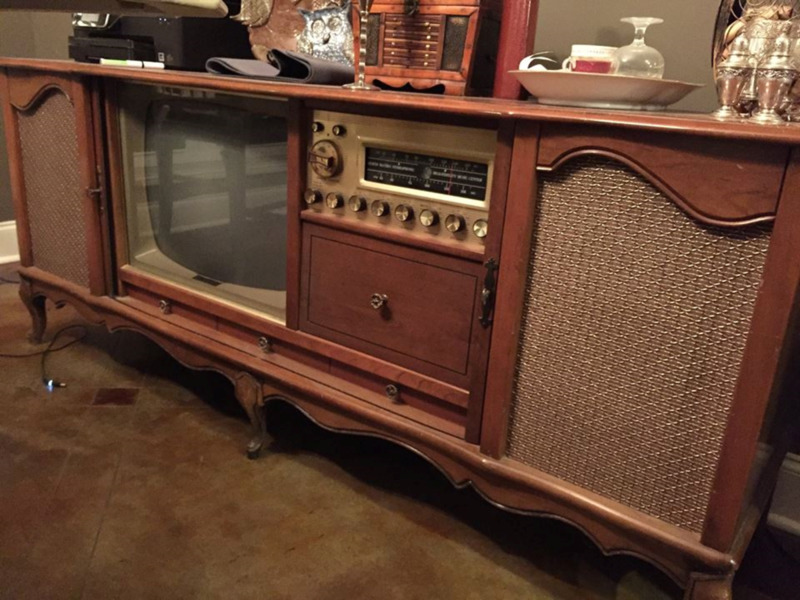 Many hard working women hands wired the chassis of these beautiful Curtis Mathes stereos and television console back in the 1960s. When a chassis goes to the cage it is time for the last and most important inspections. fabricating, plating and wiring are check for the last time before installation in the console. 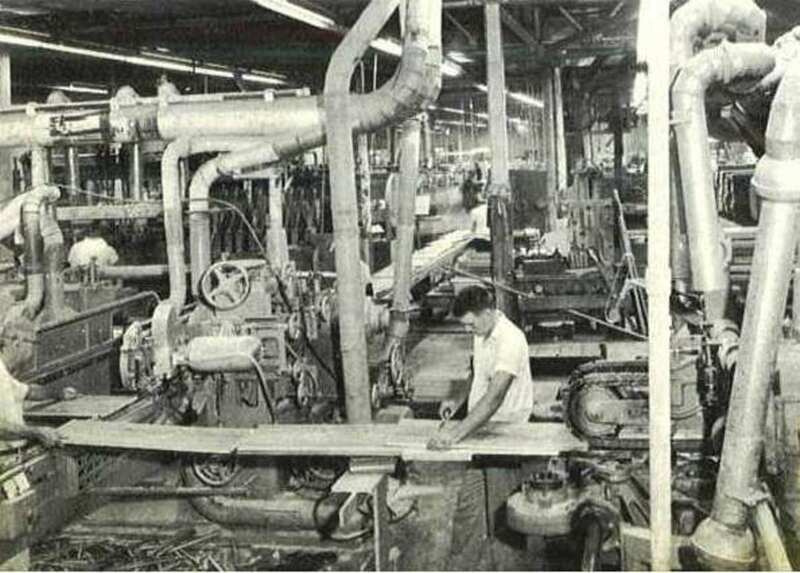 In the photo below is the Curtis Mathes Finishing Department in 1960. This picture shows the giant convey-organized finishing room in the Athens plant. Shown here is the rubbing section where the cabinets are carefully rubbed to bring out all the beauty of genuine precious woods. The assembly of the completed cabinet are molded, trimmed to size, bored for dowels, doweled, sanded and inspected. Dedication to quality and a desire for perfection was what drove the Curtis Mathes Company in 1960. It was a Texas size pride in doing something great and lasting. Women made up a good number of the work force at all four Curtis Mathes Plants in Texas back in 1960. Because the were good with their minds and their hands, and never let any past unless it was flawless. This console is over 55 years old this year 2015, and everything still works, the television, the FM & AM radio, and the Curtis Mathes made turntable.. A true timeless classic. 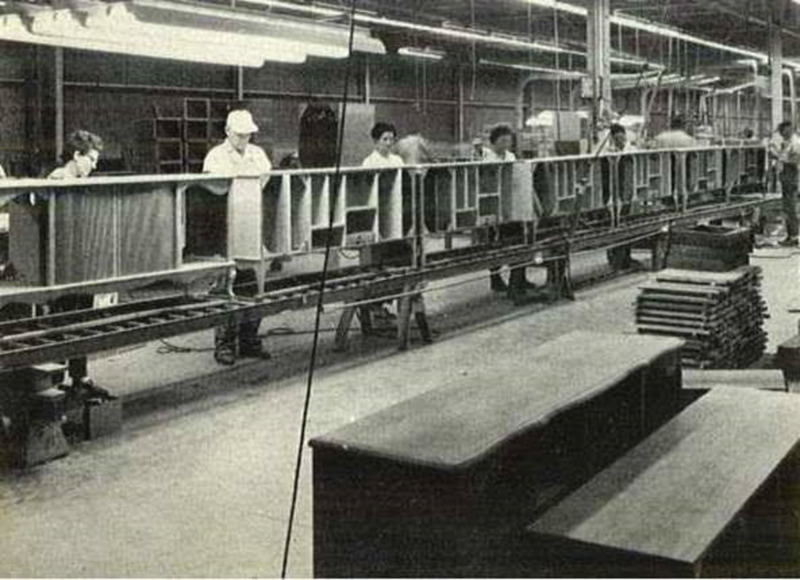 In the photo below is the Conveyor Line for Sides and Topes at the Curtis Mathes Plant in Athens Texas in 1960. The sides and tops for the CM Hi-Fi are trimmed to size, banded, sanded and inspected on this line. Highly mechanized line such as this makes it possible for Curtis Mathes to produce the very finest cabinets at cost only slightly above inexpensive furniture. 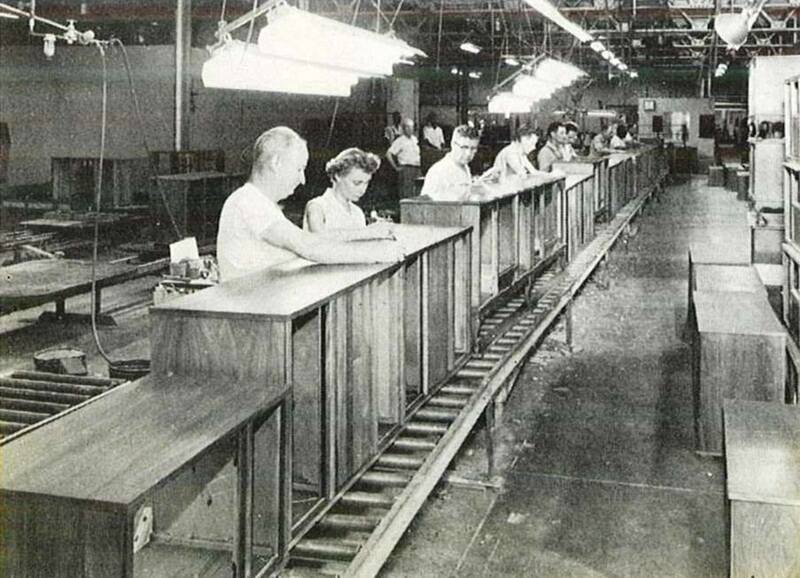 The Conveyor Line for Sides and Tops at the Curtis Mathes Plant in Athens Texas in 1960.